Whisky is a must-have for Bonfire Night – the annual UK celebration on 5 November commemorating Guy Fawkes’ attempt to blow up the Houses of Parliament in 1605. For those moments when the bonfire’s glow isn’t quite sufficient, you need something warming in your hip flask to keep out the chill. But what whisky works best – an apparently apt smoky Islay malt, or a reassuringly rich Sherry bomb? Let’s ask the experts for their Scotch whisky recommendations… and favourite Bonfire Night memories. ‘I have two distinct fireworks memories, both disreputable. ‘When my children were younger, we used to build a big bonfire in the garden and invite other parents to bring one decent firework. Needless to say, the parents were plied with drinks prior to lighting the bonfire. ‘On one occasion, the night was damp and the Guy reluctant to burn. Well-fuelled, I seized a can of petrol and shook it vigorously upwards towards the Guy, little thinking that the majority of the petrol was raining down on me, and that I was very close to the fire. ‘Mercifully, my ignition was gradual and I managed to roll on the ground before spontaneously combusting. ‘The second was at the sensational Edinburgh Festival Fireworks. A friend identified an empty hotel on Princes Street, immediately opposite the castle, where the fireworks display originated. ‘It had a flat, leaded roof as big as a ballroom, but could only be accessed via a fire escape, a ladder and a steeply pitched drain-pipe. Fine going up, but after an hour or so of partying on the roof, testing to descend. Several slid off, but were happily caught by those on the fire escape below. ‘The ideal whiskies to accompany fireworks are redolent of cordite. This aroma and taste used to be more common, but is now unusual. Older Springbanks have it; some of the (excellent) new Glen Scotias and some Taliskers. ‘I fondly remember my grandmother keeping us warmed up with servings of stovies, fruitcake and thimblefuls of whisky hot toddy on Guy Fawkes Night. It was always a happy time! ‘My ideal whisky for fireworks displays would be warming, mouth-coating and velvety, with concentrated dark fruit flavour and a long, warming finish. ‘My first choice would be Bowmore 15 years old Darkest, which I’d recommend enjoying outdoors by the bonfire. It’s like being wrapped in a velvet blanket as baked-fruit fireworks burst on the tongue, tempered by a trail of smoke and tannin-rich oils. Best served with (or in) a mug of hot chocolate, enjoyed with dark chocolate pieces and toasted marshmallows from the bonfire. ‘Your Fireworks Night dram needs to be a crowd-pleaser – now isn’t the time to pull out that “interesting” number that you enjoy on the odd occasion: you’ll be there with friends, so you’ll be sharing (…won’t you?). ‘You want something to reflect the night – warming, slightly spicy and with a sparkle. This year I’ll be watching the Victoria Park fireworks with some dear friends, and in between our porters and ales I’ll be passing round a hip flask of Aberfeldy 16: baked apples and rich vanilla ice cream, salted caramel, cinnamon and chocolate spread on toasted rye bread. ‘The Port Ellen maltings on Islay is on the edge of the village, and that is the spot where the village bonfire is built every year. It was always a great night at a time of year with few tourists, so the event was dominated by locals. ‘Over the weeks leading up, everything from old pallets, bits of furniture and usually a Guy would be dropped off by villagers ready for the bonfire. ‘It was always a nervous time for me – hoping that the wind would be in the right direction and not towards the maltings, or especially the warehouses of the old Port Ellen distillery. Incidentally, it’s the only bonfire I’ve been to where the fire brigade would turn up and throw more wood onto the fire. ‘If I’m at a bonfire event, then I want something that will warm the cockles and not get lost in the environment of a roaring fire, smoke and food (got to have a barbecue at a bonfire party – right?). I reach for something that is smoky, strong and wears its character on its sleeve. ‘My go-to at this time of year is Talisker 57 North as it is full of Talisker flavour: smoky, salty and rich, combined with a big 57% abv that helps keep out the cold. I also love a big Sherried whisky when the nights are long, and I can’t think of anything nicer than an Aberlour A’bunadh. ‘It’s pretty common knowledge that I’m a bit of a pyromaniac. I love a good barbecue in the summer months, a smoky, dry leaf-fuelled bonfire in autumn and a roaring log fire through the winter. ‘My favourite, however, is a bonfire on a crisp November evening with my constant companion Big Peat… ‘His’ characteristics very much resemble those of my autumnal bonfires – ash, charred wood, an earthy, warming character and of course smoke – and lots of it. ‘I do, of course, have the utmost respect for our peers in the industry, and when I fancy straying from our own offerings, I reach for the Glenturret Sherry Edition. ‘For as long as I can remember, I have always been fascinated by fireworks and Guy Fawkes Night. In my youth, I remember always saving my pocket money up to buy fireworks, or “squibs” as we called them in Scotty-land. 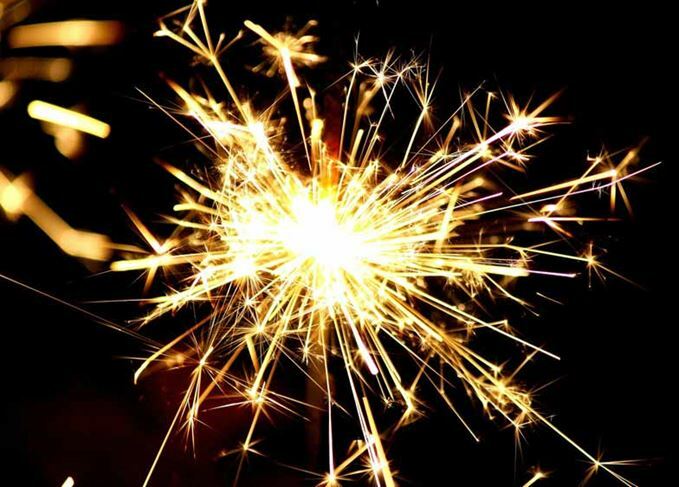 ‘We would end up setting off fireworks for weeks before the big event itself, and in fact one of our favourite ruses was to set a bundle of fireworks off inside an old whisky bottle (of which there were always plenty in my household). ‘In the Lumsden household, we will normally hold a little fireworks party on 5 November, where as well as setting off countless colourful rockets, we will also gather round a fire-pit, and try to cook some sausages over the naked flames. ‘The overall combination of aromas, from the smell of the fireworks themselves, to the smell of the fire-pit, and the delicious smell of the charring sausages, naturally leads me to select one, overall “must-have” dram for Fireworks Night, and this is the mighty Ardbeg Uigeadail. ‘This Bonfire Night, I’ll either be sipping a Bunnahabhain Ceòbanach or, from another distiller, I’d go for a Laphroaig 10 Year Old. Both great on a chilly November evening.